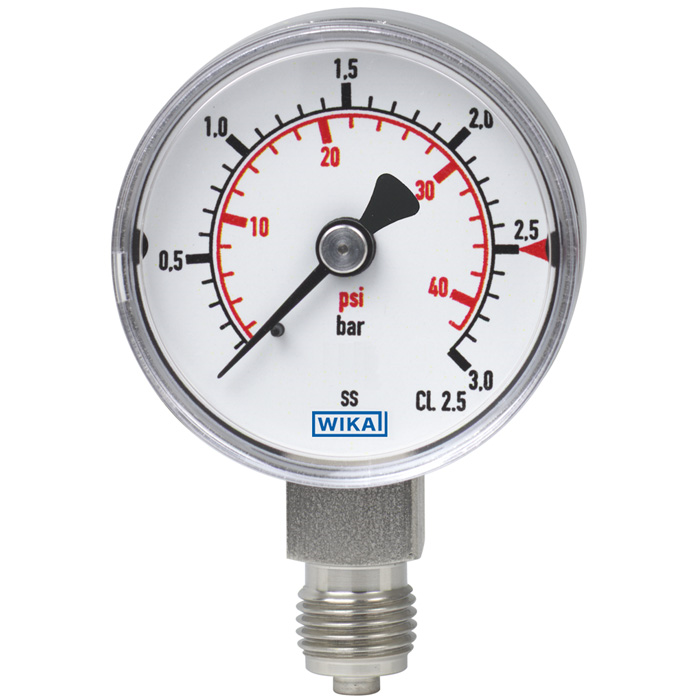 The compact model 131.11 Bourdon tube pressure gauge is constructed with a case and wetted parts from stainless steel. The instrument meets the requirements of the international industry standard EN 837-1. The modular design enables a multitude of combinations of process connections, nominal sizes and scale ranges. Due to this high variance, the instrument is suitable for use in a wide range of applications within industry. The instrument is frequently used as a failure alarm indicator on gas cylinders. With its compact design and moderate purchase costs, the pressure gauge also qualifies for machine-building and plant-construction applications. Due to the use of high-quality stainless steel materials and its robust design, the instrument is suitable for liquid and gaseous media, also in aggressive environments. For mounting in control panels, the pressure gauges can be fitted with a surface mounting flange or with a triangular bezel and mounting bracket.